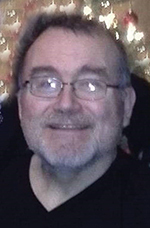 Ricky “Rick” Allan Ruport, 59, of Denver, died Monday, December 17, 2018, at UnityPoint-Allen Hospital in Waterloo following a lengthy illness. Rick was born March 14, 1959, in Rochester, Minnesota, the son of Stanley and Elaine (White) Ruport. He graduated from Central High School in Waterloo in 1977 and then attended Hawkeye Tech in Waterloo. On July 26, 1980, he was united in marriage to Laurie Roberts in Waterloo. Over the years he worked for Chamberlain Manufacturing, his father’s landscaping business and Black Hawk Engineering. He graduated from the University of Northern Iowa in 2012 with a degree in Technology Management, an achievement he was very proud of. He then worked on contract for John Deere in both Davenport and Des Moines until a stroke forced his early retirement. Rick was an avid Iowa Hawkeye and Green Bay Packer fan. He was a member of the Cedar Valley Woodworkers and ran his own computer business, Westbourne Technical Services, building his first computer in 1981. He loved politics and wasn’t afraid of a good debate, in fact, he was known to ‘stir the pot’. Above all, he was a family man – he especially loved spending time with his grandchildren. Rick is survived by his wife, Laurie of Denver, one daughter, Sarah Cowell of Denver, one son, David Ruport of Denver, four grandchildren, Kai Cowell, Liam Cowell, Emma Johnson and Rozalyn Ruport, one sister, Kelly (Cliff) Walters of Waterloo, two brothers, Terry Ruport of Chandler, Arizona and Scotty (Sharyl) Ruport of Urbana. He is preceded in death by his parents. A Celebration of Life will be held on Friday, December 21, 2018, from 4:00 p.m. to 8:00 p.m. at the Denver American Legion Hall with a Prayer Service beginning at 4:00 p.m. The family encourages all who attend to wear their favorite sports attire. Memorials may be directed to the family and on-line condolences may be left at www.kaisercorson.com.